Sorry to mention it again, but here in France the graphic novel is big, really big, business. Whole sections of bookshops are devoted to them and although there are children’s editions they are mainly adult in content with many classic British novels (including Shakespeare) translated into the genre. A new bibliotechec (library and media centre) was opened recently in a small town near us with a large range of graphic novels and which was celebrated with an expo of graphic novel artists showing off their skills. The UK seems to out of step with the rest of the world in relegating the graphic novel to just being a children’s format – they are big in all European countries, Japan and America so to expand your future market you could ‘go graphic’. Nothing wrong with a graphic novel. I always knew they were big in France thanks to Asterix and Obelix. Remember reading them from the local library as a kid and they seemed different from the sort of cartoons we used to read. Longer stores and much more involved than the stuff in comics. I can certainly see the appeal as you have something that is both book and art. There’s a heck of a lot of skill and time involved in the creative process. 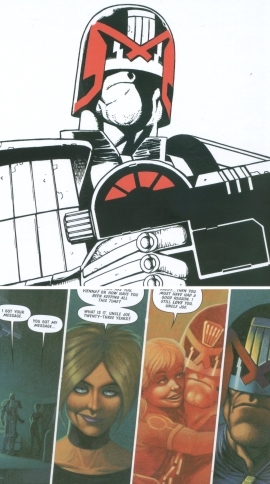 Forgot to mention that I knew one of the artists who worked on the Judge Dredd stories as he had a studio near me in Colchester. In some instances he would photograph a model from odd angles to get the correct perspective. It was all done in black ink on layout paper and coloured in later – now, of course, it’s drawn on a computer.